From Goodreads: Larrikins or patricians, socialists or silvertails - in the century following Federation, Australia's prime ministers were as diverse as the nation they served. Some came from backgrounds of rural or urban poverty and were largely self-educated, looking to the ballot box as a tool of social justice; some were drawn to politics as their destiny; still others regarded high office as no more than their due. One or two demonstrated that, as well as being the art of the possible, politics can also be the art of the unlikely. In this lively and authoritative book, 21 historians, biographers and political analysts discuss and profile the men who have attained Australia's highest public office and the forces that shaped them. In doing so, Australian Prime Ministers obliquely considers the nature of Australian democratic and political power. Thoughts: With the recent death of Gough Whitlam I found myself wanting to know more about the people who had lead Australia over the past 100+ years. My information above (the cover and the blurb from Goodreads) is a bit of a mish-mash. I read the most recent edition, which is the cover I used. As it was not available on Goodreads, I took it from Booktopia. 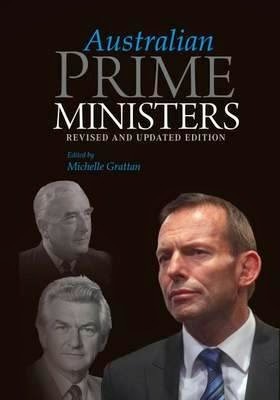 The blurb comes from Goodreads, but doesn't include Julia Gillard or Tony Abbott who are included in the most recent edition. This was a really fascinating read. Most chapters were no longer than 30 pages, making it easy to read a chapter a day which was my aim. I can now say my knowledge of my country's leaders is a lot stronger and I have a much better idea of how our parliament and the parties within it have developed. As always with history, hind sight is a wonderful tools. A few years distance can see a Prime Minister judged very differently to they way they were perceived in office. One thing they all have in common though is that under their leadership, both good and bad decisions were made. As to what you yourself see as a good or bad decision may depend largely on your own personal politics.